How appropriate that Mars enters the sign of Venus on San Valentine’s day! From daredevil and impossible to sensual and possessive. 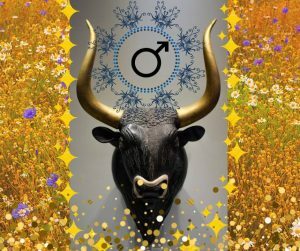 Mars in Taurus thrives on security, safety, routine and organization, slow to warm up but super passionate once the fire is lit. Mars is in his detriment in Taurus, he’s not his usual self so anger tends to fester and boil but when it explodes the devastation is usually total and irreversible. On the plus side no one resists and perseveres longer than Mars in Taurus in any endeavour he undertakes. Are you looking forward to the switch from Aries to Taurus?